This is a sub-page in the "Suicide and Attempted Suicide: Methods and Consequences" website. If you want to get back to the main page, click here. 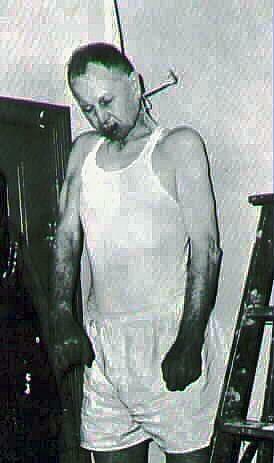 Suicide and other traumatic injury photos and drawings. Warning: Gory! Organized alphabetically by method. Source: found on the web, unless otherwise noted. If this is your material, please let me know whether you want to be credited, have the item removed, or some other alternative. Some things can't be adequately described in words. If that doesn't answer your question, try: To inform would-be suicides---people should know what they're getting into. Some of them are poor quality (generally scans of photocopies of not-very-good medical images), but may still illustrate the intended point/information. They will be replaced if, when, and as I find others. Feel free to send better ones to me, or point me to them. Part of what I'm trying to do is to show potential suicides what's likely to happen. I really don't know if "more" is better, worse, or irrelevant for that purpose, but I'd rather err on the side of too much than too little. If anything, many of the photos are not graphic enough, as a number of them were cleaned up for their original forensic purpose, and they are less realistic for "what-might-happen-if-you-do-this" purposes. Why not only suicide pictures? While I'm trying to show the effects of suicide attempts, the physical results are similar to homicide or accident by the same means. In addition, many of the trauma images found on the web don't specify suicide/homicide/accident. Drawing of "sleeper hold": compression of carotid artery. Drawing of "sleeper hold": compression of carotid artery, detail. 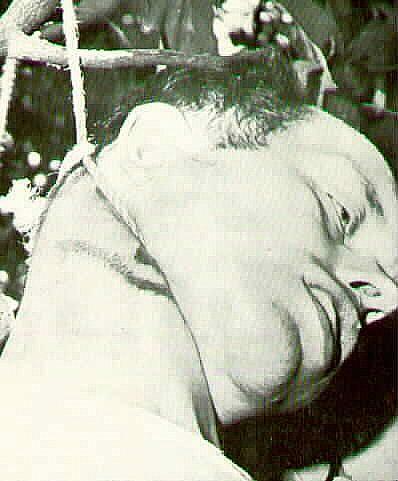 Use of rod to tighten a loop of rope around neck. Whole-body trauma from impact with motor vehicle. Whole-body trauma from impact with motor vehicle, 2..
Cuts, self-inflicted but not suicidal intent. Drowning. Foam at mouth and nose. Drowning. Appearance of body after 7 days under water. Color of hand after carbon monoxide poisoning. Electrical contact burns to the hand. High voltage burns to the arm. High voltage burns to the arm, 2. High voltage burns, full body. High voltage burn, amputating an arm. Homemade circuit-completion device used in suicidal electrocution. Contact gunshot wound to the head. Contact gunshot wound to the head, 2. Contact gunshot wound showing pattern of gun barrel. Contact gunshot wound to the head, showing unburned gunpowder. Distribution of sites of suicidal gunshot wounds to the head in Seattle [Eisele, 1981]. Gunshot to head, suicide, 2. Gunshot to head from high-powered pistol. High-powered rifle bullet to the head. Initial surgical reconstruction following shotgun wound to the head, suicide attempt. Pinch marks on hand of suicide that cleared her boyfriend of murder indictment. Shotgun wound to the head, suicide attempt. 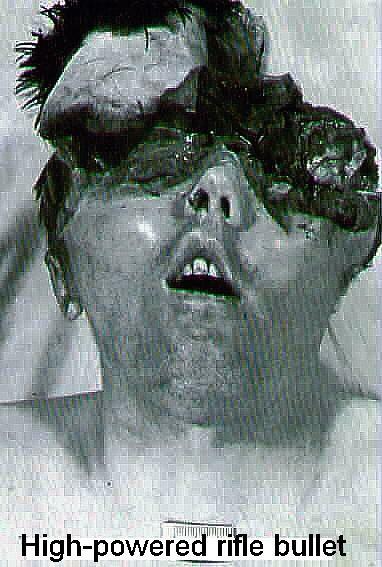 Shotgun wound to the head, suicide attempt, 2. 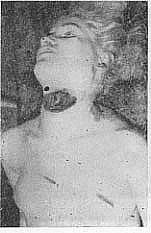 Shotgun wound, entrance under chin. Shotgun wound, entrance under chin, 2. Shotgun wound to the head, homicide. Shotgun wound to the head, suicide. Shotgun wound to the head. Two shotgun wounds to the head, suicide. Death of elderly man due to pressure on his neck from a chair. Hanging of Anne Green, ca. 1650, contemporary woodcut [Hughes, 1982]. Hanging, 8. 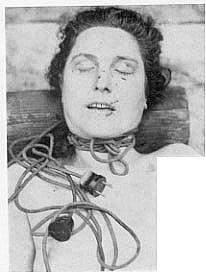 Note pooled blood in hands, arms, and chin. Hanging, 10. 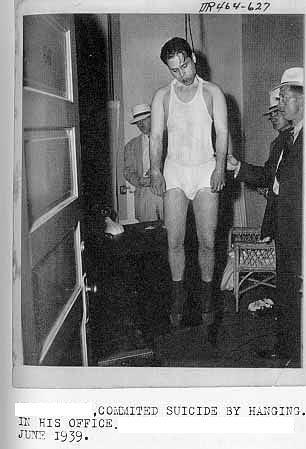 Note pooled blood in hands and arms. Knot positions commonly found in suicidal hanging [Simonsen, 1988]. Ligature marks on neck after hanging. 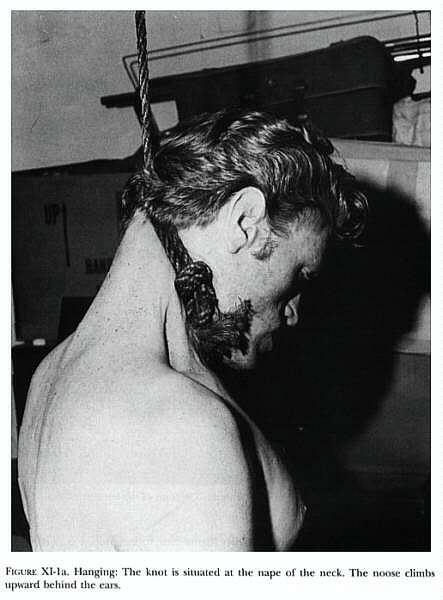 Ligature marks on back of neck after hanging; knot toward face. Accidental strangulation of child by toy telephone cord. Relationship between height of falls and Injury Severity Scores (ISS). [Source: Bostman, O.M., 1987] Details in "Suicide and Attempted Suicide" pp378-80.